FILE - A nurse practitioner prepares a flu vaccination in Rockville, Maryland, Aug. 27, 2010. The scientific community has long acknowledged that vaccines work and have saved millions of lives. However, a vocal community, particularly in the U.S., believes that vaccines expose children to health risks and can cause harm. It can be easy to write off these opinions, but psychology researchers have long known of many cognitive biases that can lead people to make poor judgments. Several of these researchers are interested in how people end up receiving and believing fallacious ideas as they relate to vaccines. The human mind isn't like a computer. Our brains aren't composed of truth values coded as ones and zeros. Emotion, confidence and memory can all impact how we form beliefs. The problem is we often don't recognize when we aren't thinking logically. Gordon Pennycook, a researcher at Canada's University of Regina, said he's interested in "the tendency for people to be lazy in the way that they think." Essentially, he said, high-level reasoning takes a lot of mental effort, and we humans are cognitive misers. If we don't have to think that hard, we won't. "Part of the problem, though," Pennycook told VOA, "is that when it comes to more complicated domains, like in the realm of science, our intuitions are often wrong. So we need to spend more time thinking about it." In 2015, Pennycook published a paper titled On the reception and detection of pseudo-profound bulls**t that focused on whether people find meaning in statements randomly made up of common buzzwords. One example: "Hidden meaning transforms unparalleled abstract beauty." He found that people who ascribed meaning to these nonsensical statements were more likely to believe in complementary and alternative medicine, which Pennycook asserts are the same people who are less likely to get vaccines. "I don't want to call it open-minded, but it's a so-open-minded-that-your-brain-kind-of-falls-out type of situation," he said. The unwillingness or inability to think critically is somewhat tied to another well-known psychological phenomenon, the Dunning-Kruger effect. First formally identified in 1999 by its namesakes, the cognitive bias refers to a broken link between actual knowledge and perceived competence. As Pennycook puts it, "The incompetent are too incompetent to recognize their incompetence." FILE - Biologist Jason Plyler prepares to test how immune cells react to possible flu vaccines at the Vaccine Research Center at the National Institutes of Health in Bethesda, Md., Dec. 19, 2017. For example, people with little knowledge of vaccines may feel extra certain about the little information they have, whether it's correct or not. Pennycook noted this can create the frustrating situation where "the people we want to help the most are the least aware of how much help they need." And when people feel confident, they aren't likely to try to challenge those beliefs or ideas. This phenomenon is referred to as confirmation bias. Panayiota Kendeou, an educational psychologist at the University of Minnesota, said the pre-existing belief that vaccines are dangerous "influences how [anti-vaccine parents] evaluate any information that they come across, and they view the information in alignment with their pre-existing beliefs." Confirmation bias creates a filter on new information. Information that a person agrees with is strengthened, while evidence to the contrary is ignored. In Kendeou's opinion, "that's the major or main bias when it comes to vaccinations." Kendeou studies reading comprehension and learning, but is particularly interested in what those messages contain. She is an expert in misinformation and has researched how inaccurate or totally misleading information is assessed by a person reading it. 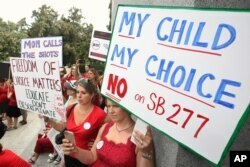 FILE - Protesters decry a measure requiring California schoolchildren to get vaccinated, at a Capitol rally, June 9, 2015, in Sacramento, Calif. The bill, SB277, which allowed only children with serious health problems to opt out of school-mandated vaccinations, became law and took effect in 2016. She decided to test whether she could change the way people engage with written misinformation. Kendeou had participants read messages about vaccination, but some of the participants were told to pay special attention to who made claims and whether those claims made sense. Kendeou found corrective measures like this did help those participants recognize misleading information. And, she told VOA, "what we find a month later is that we get some maintenance of the effect." It wasn't a large difference, but participants were still better at correctly rejecting bad information about vaccines than they were before the test. When reflecting on how to reach anti-vaccine people, Kendeou said, "Having good logical arguments, it's a great first step. But also alerting [people] that they need to pay attention who provides those logical arguments is even more important." Unfortunately, accepting new correct information can be difficult if a person is feeling fearful. "What we know from our work is that negative emotions like fear and anxiety narrow your attention," Kendeou said. "And when you end up in that state of mind, you do end up focusing on certain information and not other [information] because of that narrowness in attention." Fear of an immediate threat, even one that's not real — like getting the flu from the influenza vaccine — restricts a person's ability to see the whole situation. That metaphorical tunnel vision can limit people's ability to think critically. 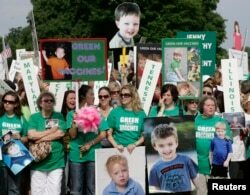 FILE - Families from across the U.S. living with autism take part in a rally calling for the elimination of toxins from children's vaccines in Washington, June 4, 2008. But Derek Powell, a postdoctoral scholar at Stanford University, suggests that fear could also change the minds of people who don't support vaccines. "At root, that [fear] is kind of the thing that's driving this, for good or ill," he said. Rather than focusing on the oft-disproven idea that the MMR vaccine causes autism, Powell and his colleagues wanted to test if a message about the severity and risk of contracting measles, mumps or rubella convinced parents that vaccines are necessary. In a 2015 experiment, they did just that. Powell assigned participants to one of three groups. The "fear" group was told about the chances of catching an immunizable disease and the resulting severe symptoms. In a second group, participants heard about studies proving vaccines don't cause autism. A third group was given no additional information. Powell said the idea was "even if you thought there was a little bit of risk to a vaccine, if we persuaded you there was a lot of risk to not vaccinating, that might kind of overall tip the scale in favor of vaccination." As expected, participants who learned about the risks of contracting preventable diseases were more supportive of vaccines. Interestingly, Powell noted that "emphasizing the safety of vaccines in scientific research showing there was no autism link between MMR vaccine and autism wasn't really effective." It seems that just refuting an existing belief about vaccines isn't enough. Powell said that some beliefs can be "sticky," in that they are difficult to dismiss. Kendeou, the University of Minnesota educational psychologist, agrees, saying while there are ways to combat bad information on vaccines, "there is no magic 'erase and replace' strategy." Misconceptions, she said, never fully go away, but we can lessen their impact by reminding people to think critically and seek good evidence to refute bad arguments. Researchers and communicators still find it difficult to keep that advice in mind. "There's a tendency to want to shake somebody until they start acting sensible, and I totally understand it," Powell said. "I've felt it myself, but I don't think it's actually going to work in terms of changing their minds." For at least one previously anti-vaccine mom, Powell is correct. Carli Leon, a mother of two children and previously self-described "loud voice" against vaccinations, said insulting comments online didn't change her mind. "When people would ridicule me and call me a bad mother, it only made me dig my heels in more. What helped me was people asking me questions [that] got me to think. That got me to recognize the hypocrisy of the anti-vaxx community and my own hypocrisy with my own beliefs that I had," Leon said. "You never know who is reading these posts online," she added. "It might just change somebody's mind."